Do you have a minute to spare to learn some English? Here's Kee, who's super keen to explain the difference between must and have to. Give us 60 seconds and we'll give you the English! Hi, this is Kee from BBC Learning English. 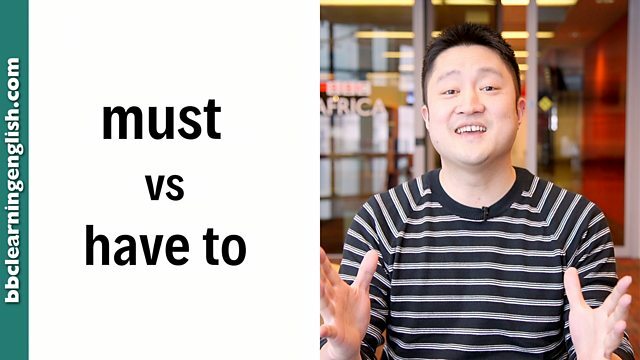 Today, I'm going to tell you the differences between must and have to. Both must and have to talk about obligations. However! Now, we use have to when we talk about obligations others decide for us. It's a law or a rule, so it cannot be changed. For example: At BBC, we have to show our passes to enter the building. This is a rule decided by the BBC. On the other hand, we use must when we talk about obligations we decide for ourselves or others. For example, my boss might say to me: You must be more organised. Or, I might say to myself: I must exercise more often. Both must and have to talk about obligations. Both are followed by an infinitive verb with no to. Have to is used for obligations that others decide for us. These are often laws or rules and so cannot be changed. We have to show our passes to enter the building. You have to smoke outside. Smoking is not allowed inside. She has to have a license before she drives. We use must to talk about obligations we decide for ourselves or others. You must be more organised. I must exercise more often. We must clean the house today. We use must when we talk about obligations we decide for ourselves or others.